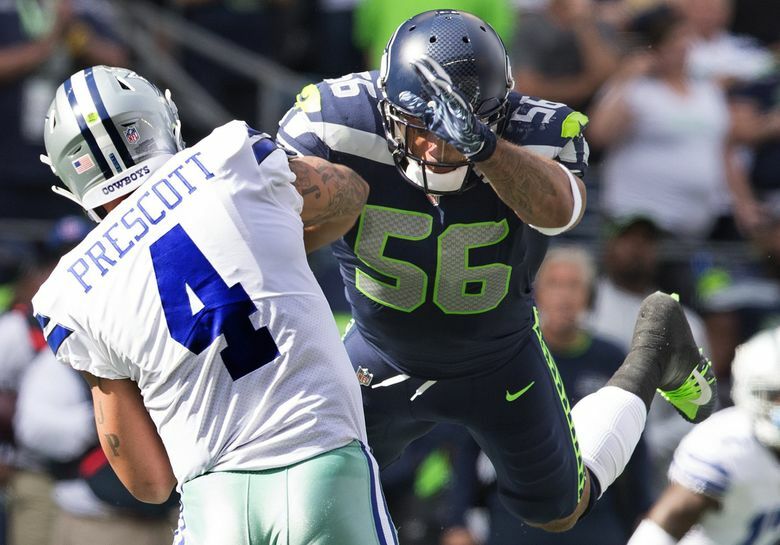 After serving an eight-game suspension tied to a felony insider-trading charge, linebacker Mychal Kendricks is ready to help propel the Seahawks towards a late-season playoff push. With a potential prison sentence looming, he's determined to focus on the present. That’s the price the 5-foot-11, 240-pound linebacker paid for pleading guilty in August to a felony insider-trading charge, admitting he made $1.2 million through four illegal deals in 2014 and 2015 while a member of the Philadelphia Eagles. After being released by the Cleveland Browns, the 28-year-old signed with the Seahawks in September and played in three games before subsequently being suspended by the NFL for the last eight. Of course, Kendricks could also face 30 to 37 months in prison as a first-time offender, but is expected to be sentenced no earlier than January. Until then, he’s allowed to play. Not necessarily with a clear conscience. “The hardest part about this is the situation itself — understanding the severity, the friends that I’ve lost,” Mychal Kendricks said on Saturday, in his first interview since his suspension ended. “No one truly understands the intricacies (of what happened). That being said, it’s understandable for people to want to walk away. Deep down, I’ll never know who’s truly with me or not. But I can tell. During the eight-game suspension, Kendricks’ circle constricted. He trained in the seclusion of Sedona, Ariz. His playbook was taken away. He tried to avoid television, only watching an occasional Seahawks game. The season went on without him. The Seahawks won five of their next eight games. His little brother — Vikings middle linebacker Eric Kendricks — piled up 16 tackles in a loss to the Patriots last weekend. And, like always, Mychal Kendricks wasn’t watching. “Honestly, watching my brother play, it makes me nervous and anxious. So I try not to watch his games,” Mychal Kendricks said. “And every time I don’t watch his games he balls out, so it’s like a superstition of mine. One thing is certain: Mychal Kendricks doesn’t need more stress. He needs football. He needs the sustained support of a second family. He needs to produce, like he did with 15 tackles and two sacks in his first three games with Seattle. And, without injured weakside linebacker K.J. Wright (knee), the Seahawks need him, too. “He looks really good on the practice field,” Seahawks head coach Pete Carroll said Saturday. “When he played for us we really felt his quickness. You could see the plays that he can make and the savvy that he has. Mychal isn’t the only Kendricks expected to play on Monday night. Eric Kendricks is listed as questionable with a rib injury, but Minnesota Vikings head coach Mike Zimmer said he “will be fine,” according to the St. Paul Pioneer Press. Monday’s game represents both a return and a reunion of sorts for Mychal Kendricks. “Special” is a word Mychal Kendricks repeated on Saturday. Losing the ability to play simultaneously shifted his perspective. “I never thought I’d say that the game of football is literally healthy for me,” Mychal Kendricks ackowledged. “But there’s something that this game does for individuals like myself, and even those who watch and love the game. We all get together on Sundays – the people who are playing and the people who are watching. Football may be special for Mychal Kendricks, but it’s also increasingly fleeting. A potential prison sentence looms. A sustained playoff run with the Seahawks won’t stop it. So how can he focus on football when the future appears so crushingly bleak? For the next four games, at least, the Seahawks have accepted him back. Kendricks has a playbook, and a purpose. He’s trying to live in the present, to make his (remaining) friends and family proud. That starts with a meeting with the Minnesota Vikings on Monday night. “What do I visualize?” Mychal Kendricks said, repeating a reporter’s question. “Man … making plays, going out there with my boys, competing at an all-time high level, solidifying myself as a Seahawk.